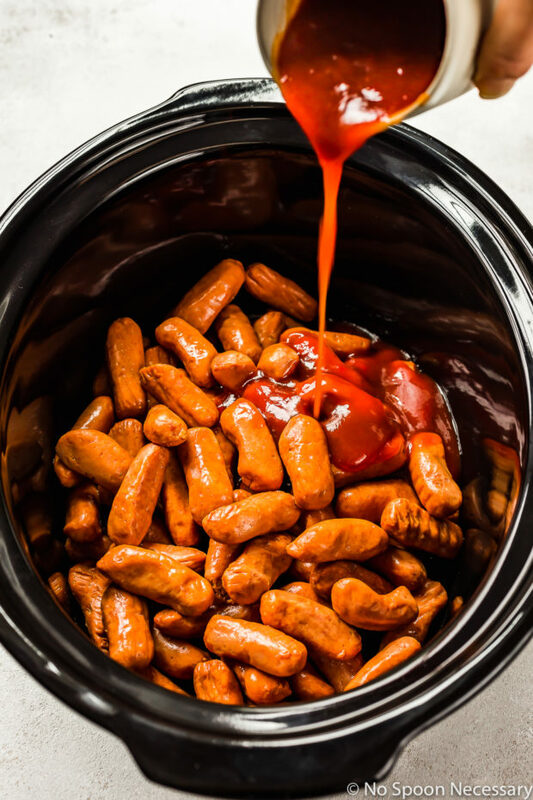 These Slow Cooker Honey Sriracha Little Smokies are crazy addictive and ridiculously easy to make thanks to the crockpot! 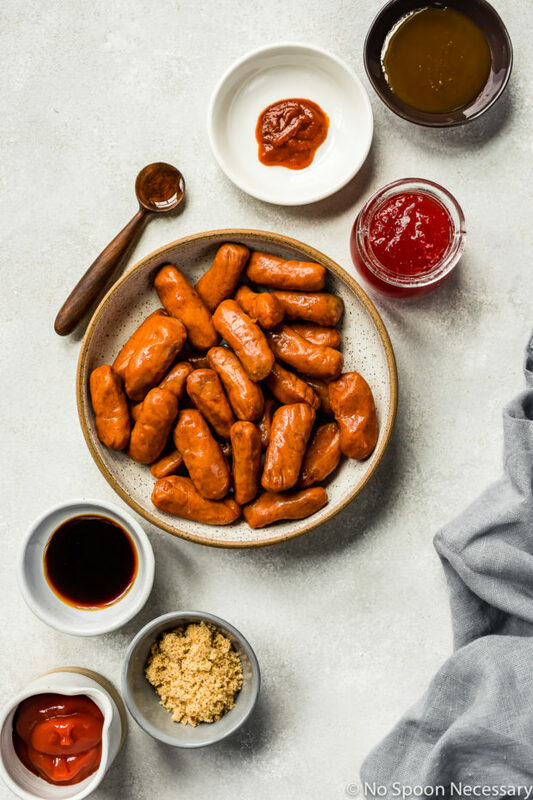 Full of sweet and spicy flavor, these mini cocktail sausages are perfect for game days, potlucks and parties! Hey there, friends! Happy almost weekend! 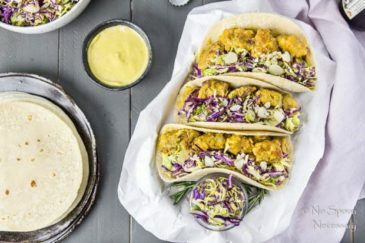 With football season in full swing I thought it was high time I shared some epic game day grub! 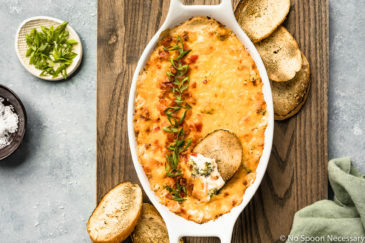 But, don’t worry if you’re not a fan of the gridiron pastime, because these saucy, bite-sized bad boys are also the perfect starter for all your fall parties or a delicious appetizer for holiday entertaining! And, these weenies can even be devoured for dinner if you’re into that kind of thing (no judgement here because Boy was very into declaring these appropriate for dinner). 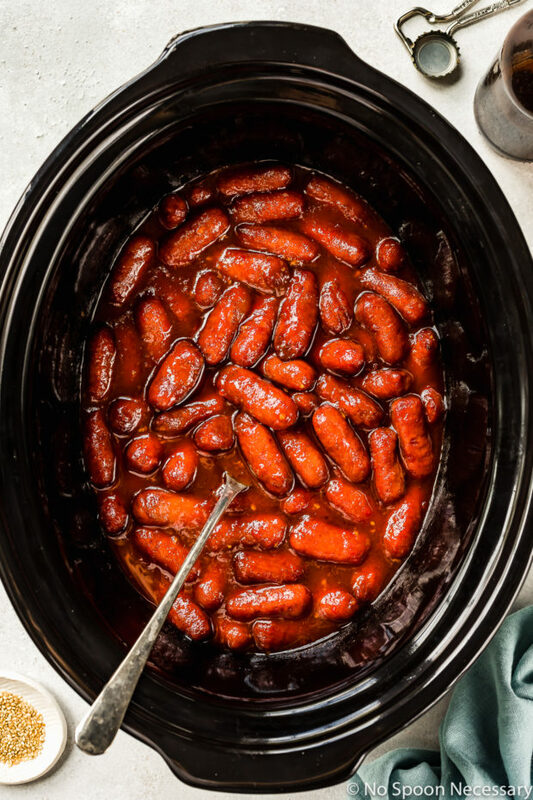 Fair warning, these crockpot little smokies are crazy addictive! 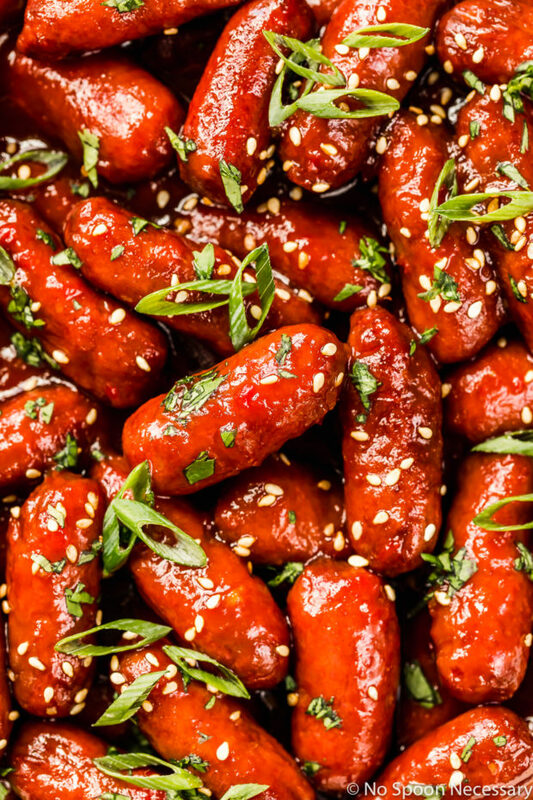 Plump, juicy, bite-sized cocktail sausages in a silky, sweet and spicy Asian-esque BBQ sauce laced with red pepper jelly and spiced with pungent garlic. Spicy, smoky and sweet, these little smokies only require a handful of ingredients and 10 minutes of hands on prep time to make!! 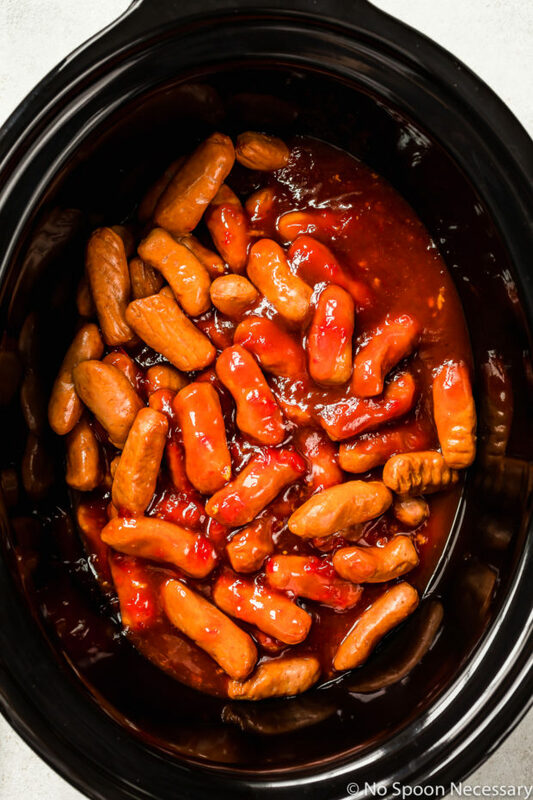 These effortless crockpot cocktail weiners are perfect for potlucks, game days or holiday entertaining! Little smokies, or Lit’l Smokies, are simply cocktail sausage links made from different cuts of meat. There are a variety of little smokies, from turkey or beef to bacon and cheddar. Little smokies are delicious bite sized, cocktail weiners that can be served either as an appetizer or part of a full meal. Yes, little smokies sausages are fully cooked! However, they do need to be reheated before eating! Can little smokies go bad? How long are little smokies good for? Since little smokies are a perishable food, they can definitely go bad. Opened packages of little smokies will keep in the refrigerator for 1 week. Alternatively, little smokies can be kept in the freezer for 1-2 months. 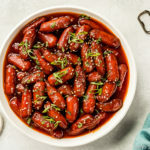 These crock pot honey sriracha little smokies can be either stored in the refrigerator, or frozen, and have the same exact expiration as listed above (1 week in the fridge and 1-2 months frozen). To reheat the little smokies in sauce, allow them to defrost overnight in the refrigerator if frozen, and reheat either on the stove, in the oven, or in the microwave until fully heated throughout. Where to buy little smokies? Where are little smokies in the grocery store? You can purchase little smokies at most major grocery stores, or if you can’t find them locally, they can be purchased on Amazon online! Little smokies are located with the cold cuts and hot dogs in the refrigerated section of the grocery store. 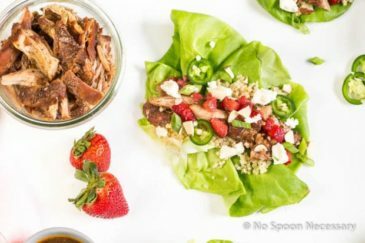 How to make little smokies in the crock pot? These saucy little smokies only require a handful of ingredients and are crazy easy to make in the crockpot or slow cooker! To make these little smokies with jelly, simply whisk together all the sauce ingredients in the bowl of the slow cooker. Next, add in the cocktail sausages and stir to combine. Cover the crockpot and cook on high for 2-3 hours, or low for approximately 4. Lower the heat and keep warm until ready to serve! 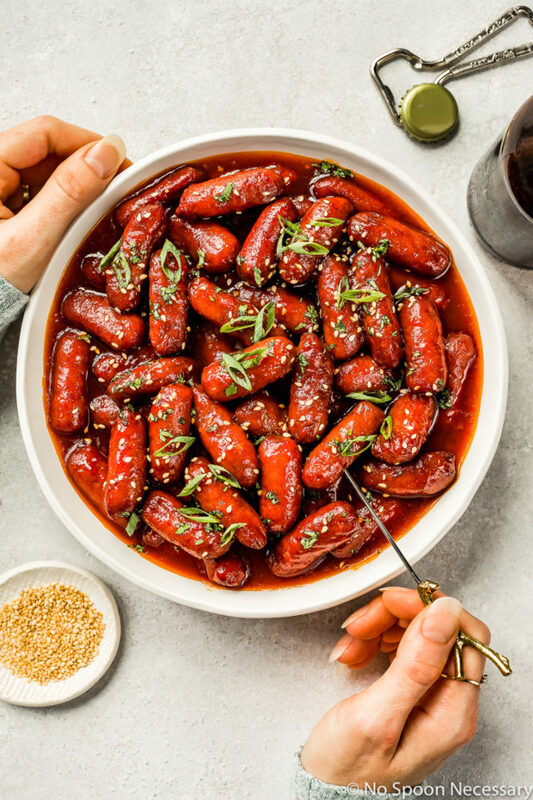 Packed with brown sugar, spice and everything nice, these sassy crockpot honey sriracha little smokies will definitely be the hit of your party! 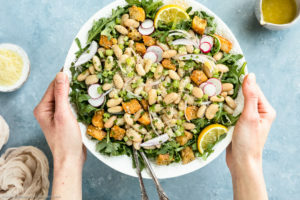 Bursting with flavor, fool-proof and ridiculously easy to throw together, don’t be surprised if people start demanding you share the recipe! Until next week, friends, cheers – to easy and effortless eats! In the bowl of a slow cooker, whisk together the pepper jelly through sesame oil. Add in the sausages and stir to combine. Cook on HIGH for 2 - 3 hours or LOW for 4 – 4 ½ hours, or until the sausages are warmed through. 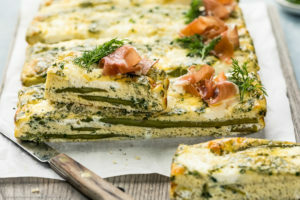 Lower heat and keep warm until ready to serve. Serve: Garnish with optional toppings and serve with toothpicks. Enjoy! If you like your cocktail sausages to be super saucy, you can use 2 (16 ounce) packages instead of 3 (12 ounce) packaged. So you have an idea of the amount of sauce, I used 3 packages in the photographs shown here. 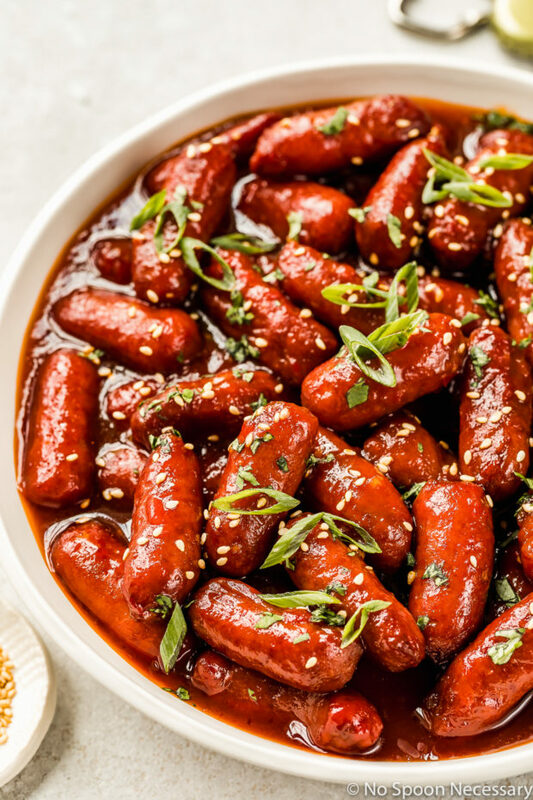 These honey sriracha little smokies can be kept in the refrigerator for up to 1 week, or frozen for up to 1-2 months. 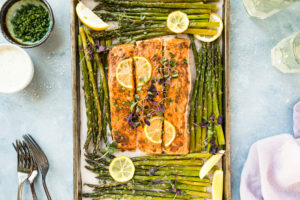 To reheat the little smokies in sauce, allow them to defrost overnight in the refrigerator if frozen, and reheat either on the stove, in the oven, or in the microwave until fully heated throughout. *Nutritional information will vary greatly depending on products used! Below nutritional values are a rough estimate. These would disappear in minutes at a holiday or game day party! And so easy!! 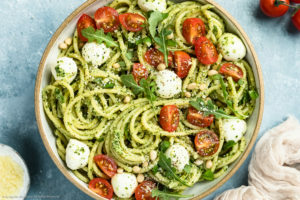 Pinning this recipe so I don’t forget! They look heavenly! I love that spicy sweet sauce a lot and the ease of preparation! Simply awesome, Chey. Yes! 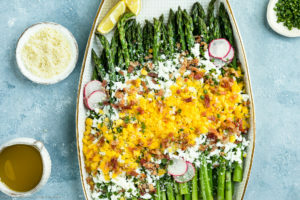 Perfect for game day (or any day!) and a great flavor variation on traditional smokies! I’m sure Tom would be with Boy and consider these a meal Chey! Actually, I think I would too! So perfect for game day eats. Can’t wait to make some for friends for a UMich game! Happy weekend! OMG! These are amazing!! I cannot wait to try these!! Shared, my friend!! LOVE these! I’m having friends over for the Duck game this weekend and these would be the perfect thing to serve! Usually I just do dips but I like that these are more substantial. And I love that they’re made with Sriracha :). Have a great weekend, Chey! I am in heaven here. These look so good Cheyanne. Is it strange that I’ve never even had a little smokie before? 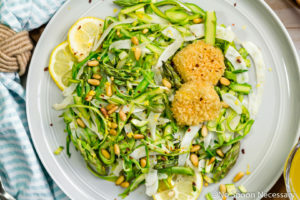 I can’t even think why, this is totally my kind of dish! I think it may be my Thanksgiving appetizer contribution this year.